I has been raining for about 24 hours straight, we need this rain and will take every drop. The garden is doing great and with the vinyl sides we don't have to worry about it splitting or rotting with all this moisture. Also, the furniture is standing up to the wet weather just fine, in fact the chair in front of my home looks brand new with it being wet. 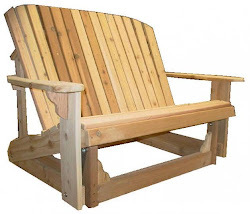 The Western Red Cedar that is used for the furniture is the perfect wood for outdoor use. It resists rot, insect damage and looks great either sealed or unsealed. My chair is unsealed and has so far lasted 2 years in the Arizona cool and hot climate. Look at our furniture and raised garden items, they will last for a very long time and are worth every penny. Oh, I said it was raining here, so far in about 24 hours we have received between 0.25" to 1.5" of rain, depends where you are standing here in the Valley of the Sun.